The 40" gemstone globe is our finest and most expensive gemstone globe available. 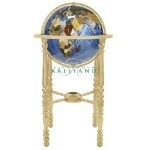 This handcrafted exquisite creation of skilled artisanship is a 40 inch diameter gemstone globe of resting on a 24kt gold-plated or silver-plated, 4-leg floor stand. 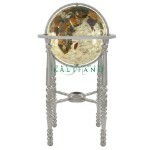 The 40 inch gemstone globe is mainly available by custom order. 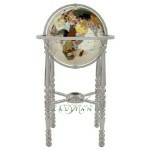 Contact us to specify globe color, stand color, and personalization for your custom gemstone globe order. Delivery is 90 days. There are a rare few ready to ship. 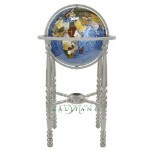 Please contact us for availability of these luxurious large floor globes.